Built for business, the imageCLASS D880 is a powerful device designed to produce high quality laser output for busy small offices. 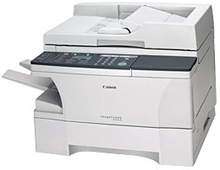 Equipped with Canon�s Single Cartridge System, the unit is virtually maintenance-free. Just put in the cartridge, make the proper connections, and you are ready to copy, print and receive faxes. For copying, use the platen glass for single page originals or the 30-sheet Automatic Document Feeder for multi-page originals. Program the quantity needed and you�re done. Multi-page documents will be collated in the output tray. You will have a large supply of paper using the 500-sheet paper cassette and the 100-sheet multipurpose tray to draw from. The multipurpose tray can accommodate a variety of sizes and types of paper stock. The imageCLASS D880 copies at 18 copies-per-minute (cpm) for letter-size documents. Using Canon�s Advanced Printing Technology (CAPT), the imageCLASS D880 also prints with high-quality laser resolution of 2400 x 600 dpi at up to 16 pages-per-minute (ppm) for letter-size prints. Fax and receive documents with ease. Documents will transmit with Super G3 (33.6 Kbps) modem speed, which keeps phone line costs down. With a host of convenient features like 12 Speed Dials, 100 Coded Dials, 255-page memory backup and print in order, faxing will be simple and effortless.